A 31-year-old man with past medical history of hypertension and status post-multiple thoracoabdominal gunshot wounds two weeks prior presented to the emergency department with chest pain and shortness of breath.The patient was treated at an outside hospital with bilateral chest tubes and discharged after 11 days without surgical intervention.Chest CT angiography and abdomen/pelvis CT obtained in the ED demonstrated a moderate pericardial effusion and moderate bilateral pleural effusions, as well as a trajectory injury/laceration of the liver involving the left and right hepatic lobes (Figures 1,2). The next day, the patient underwent left approach VATS with pericardial window and placement of a pericardial drain and bilateral thoracotomy tubes. Pericardial fluid analysis showed a total bilirubin of 38.4 g/dL and the patient was diagnosed with bile pericarditis. 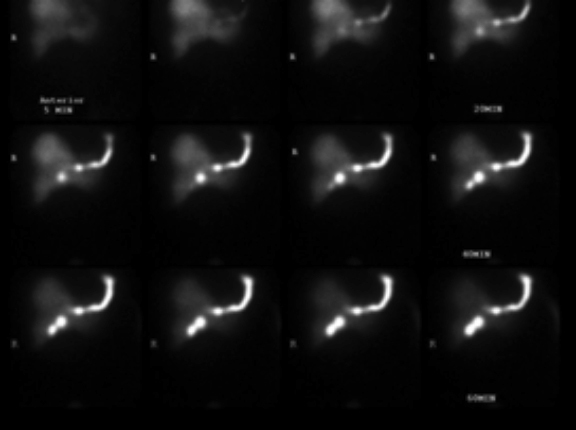 A HIDA scan was subsequently ordered and demonstrated extension of radiotracer activity into a tubular structure arising from the upper mid thorax and extending along the left lateral chest into a drainage catheter (Figure 3). 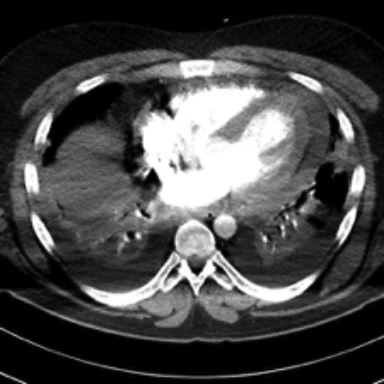 A CT of the abdomen through the level of the hepatic dome (1A) shows a large laceration with a trajectory towards the inferior margin of the pericardium.Coronal CT shows the extent of the liver parenchyma laceration and presence of pericardial effusion.The spleen and the gastrointestinal structure are intact. The moderate amount of pericardial effusion is better demonstrated in the images through the level of the heart where moderate amount of pericardial effusion as well as bilateral pleural effusions. Two-view HIDA scan images demonstrate radiotracer activity that arises from gallbladder fossa and courses superolateral towards the pericardium before exiting out the left chest pericardial drainage catheter. 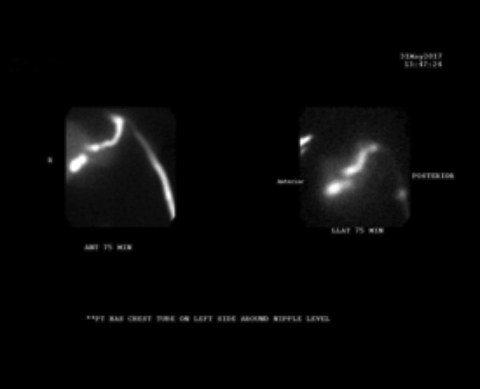 ERCP image shows left intrahepatic bile duct injury with leakage of contrast above the liver and extending towards the thoracic cavity (Figure 4). 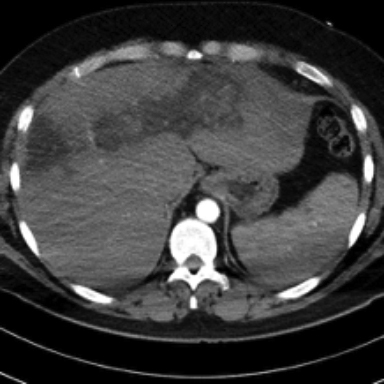 Pericardiobiliary fistula is a rare but serious complication of penetrating trauma to the thorax and only one case has been reported.In the review of the literature, a single case of iatrogenic percardiobiliary fistula formation after emergent sub xiphoid approach pericardial drain placement was found. Thoracobiliary fistula has been reported as a complication of infective or obstructive biliary process. It is considered exceedingly rare following penetrating injury. Disruption of both biliary and diaphragmatic tissues is required for the fistula formation.1 In our case, the penetrating abdominal trauma resulted in extensive hepatic damage with disruption of the diaphragm and associated pericardial injury. The biliary pressure relationship has been described in the literature and it is believed that inflammation and possibly infection from preceding trauma may play a role in fistula formation.In our case, the antecedent trauma is most likely the cause of the pericardiobiliary fistula. In comparison to the previously described case of post traumatic pericardiobiliary fistula,2 the patient did not undergo surgical intervention for the initial injury prior to fistula formation excluding a possible iatrogenic cause. Management of pericardiobiliary fistula usually requires surgical intervention.2 Endoscopic retrograde cholangiography is very useful as the initial procedure to confirm the diagnosis and also for treatment planning as it can accurately delineate the extent of the damage to the biliary system. It also has the potential for being therapeutic. 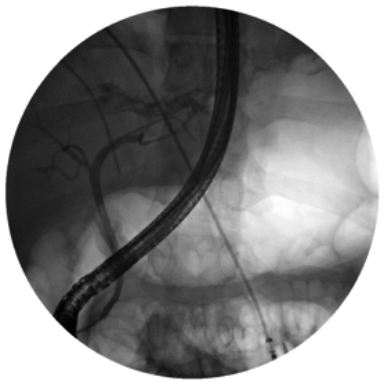 Our patient also underwent ERCP, the left intrahepatic bile duct was found to be severed with free leakage of contrast above the bifurcation suggesting biliary leak (Figure 4). Subsequently the patient underwent exploratory laparotomy with left hepatectomy and closure of the diaphragmatic injury. Postoperative imaging in our patient demonstrated resolution of the pericardial effusion. The pericardial drain was later removed. The patient’s recovery was complicated by aspiration cardiac arrest with re-intubation and abdominal abscess formation requiring percutaneous drainage and antibiotics. A new pericardial effusion in a patient after penetrating trauma involving disruption of the hepatic parenchyma and diaphragm should raise concern for the possible presence of a pericardiobiliary fistula.Pleural fluid as well as pericardial fluid analysis should be performed and nuclear medicine cholescintigraphy can be utilized as adjunct test to diagnose the presence of a pericardiobiliary fistula. Early ERCP can be diagnostic and therapeutic. Consideration should be made for placement of a biliary stent. The complexity of pericardiobiliary fistula requires a multidisciplinary approach for the diagnosis and management. Navasaria PH, Adams S, Nicol AJ.Traumatic Thoracobiliary fistula: A case report with a review of current management options.Injury. 2002; 33: 639-643.
von Riedenauer WB, Cutsinger RW, Jing XL et.al.Posttraumatic pericardiobiliary fistula causing acute bilious pericardial tamponade. J Trauma. 2010 Jan;68:E8-E10. Surman AM, Conrad MB, Barnett CF, et al. Biliary cardiac Tamponade as a Result of Iatrogenic Biliary-Pericardial Fistula.JVIR. 2013; 24(12):1925-1928. Horratas MC, Lewis RD, Fenton AH, Awender HM. Modern concepts in the non-surgical management of traumatic biliary fistula.J Trauma. 1994; 36:186–189. Oparah SS, Mandal AK. Traumatic thoracobiliary (pleurobiliary and bronchobiliary) fistulas: clinical and review study.J Trauma. 1978;18:539–544. Adachi T, Tajima Y, Kuroki T, et al.Demonstration of a biliobronchial fistula with a hepatoiminodiacetic acid scan.Am J Surg. 2006; 191: 794–796. 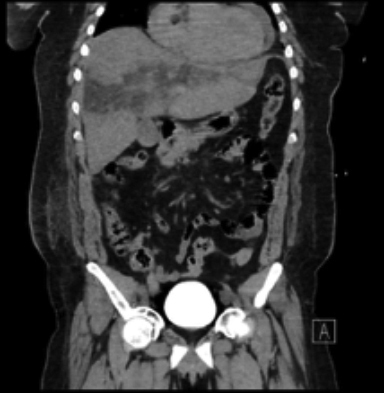 Chavez C, Golchian D, Conn D, Finger J. Pericardiobiliary fistula: A rare complication of penetrating abdominal trauma. Appl Radiol. 2018;47(8):24-26. Prepared by Dr. Chavez while a fourth-year diagnostic radiology resident; Dr. Golchian while a third-year diagnostic radiology resident; Dr. Conn while an attending radiologist and Chief of Radiology; and Dr. Finger while an attending radiologist and Program Director of the Diagnostic Radiology Residency Program, Beaumont Health, Dearborn, MI.